A bird’s bill, also called a beak, is a critical piece of its anatomy, not only for foraging, defense, singing and other behaviors, but also for birders to make a proper identification. Depending on the bird, a bill can provide clues to far more than species: age, gender, diet and foraging behaviors can all be learned by studying a bill. By knowing the basic parts of a bill and the bird’s face and head immediately adjacent to the bill, birders can be better prepared to look for the subtle clues bills can reveal about every bird. What an amazing part of the bird from its Creator. Size: How large does the bill appear in proportion to the bird’s head? Check for length as compared to the length of the head as well as the width of the bill and how that width may change along the bill’s length. Shape: Bill shapes vary widely, from delicate triangles or thin, needle-like bills to thick, bulbous bills to sharply curved bills to radical shapes that include spoon-like tips or horny casques. When the shape is very unique, that can be a diagnostic clue for a bird’s identity even if other field marks cannot be seen. Color: The color of a bill can be a clue for species, gender or age. Note the overall color as well as any specific markings, such as a colored tip or base, subterminal band or color differences between the top and bottom of the bill. Lores: While not part of the bill itself, the lores are the space between the base of a bird’s bill and the forward edge of its eyes. This area may be a different color or show a smudge or eye line that can be an identification clue. Nares: More commonly called the nostrils, the position of the nares as well as their size and shape are important to note for bird’s identities. In some types of birds, such as raptors, the nares are covered by a fleshy cere, while in others, such as many seabirds, elongated tube-like nares help filter seawater. Maxilla: Also called the upper mandible, the maxilla is the top half of a bird’s bill. Size, length and shape will vary, and some birds have knobs, fleshy wattles or other features that distinguish the maxilla. Culmen: Difficult to see on many bird species, the culmen is the center line drawn down the length of a bird’s maxilla. In some species, this can be a very distinct peak that divides the sides of the bill, while it may not be noticeable in other species. Tip: The tip of a bird’s bill may be different shapes, such as blunt or sharply pointed, depending on the bird’s general diet. Hooks are common at the tip of carnivorous birds’ bills, while many waterfowl have small bumps, called nails, on the tip of the maxilla. Mandible: The lower half of a bird’s bill is called the mandible or lower mandible. The color may vary from the maxilla either along the entire length or just at one end, and can be a great clue for identification. Some birds, such as many gulls, may show spots or other markings just on the mandible. Chin: Not directly part of the bill, the chin is the area of feathers immediately adjacent to the base of a bird’s mandible. In some species, the color of the chin may vary from the throat or face, providing a valuable identification clue. Gape: This is a fleshy area at the base of the bill where the upper and lower mandibles meet. In young birds, it is often enlarged or may seem so because the birds have not developed their mature feathers to help conceal it, and it may be brightly colored so their mouths are more noticeable when they beg for food. 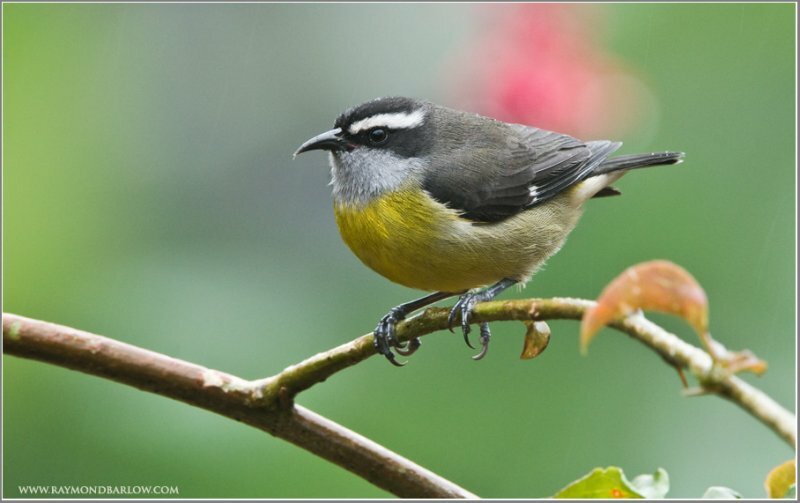 On some species, such as the bananaquit, the gape remains colorful on adult birds. It can be difficult to see many of the subtle details of a bird’s bill, but understanding the different bill parts is a great way for birders to refine their identification skills and learn more about every bird they see. This is a good introduction to the bird’s bill. 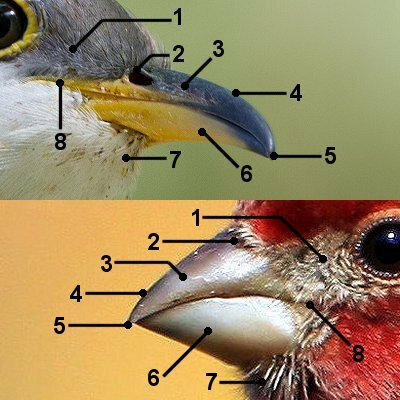 Look for more articles on the individual parts of the beak.